Silence vs. Music. The research is not conclusive on this. For example, some studies indicate that task and cognitive performance is improved when performed in silence (Dobbs et al., 2011). However, other studies found no difference in performance between music, noise, and silence conditions (Kou et al., 2018). Task Complexity. A recent study found that employees regulated their music listening according to the complexity of their work at any given moment (Haake, 2011). In this study, employees reported that they chose to listen to music when the task was routine. Conversely, they chose not to listen to music when the task was complex. Ability to Choose What They Listen To. 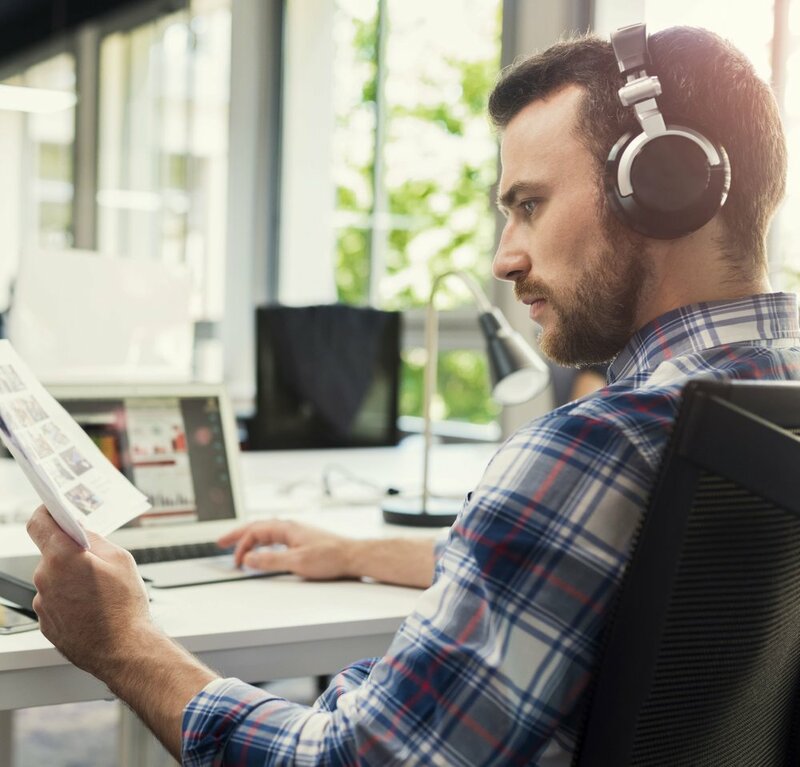 Many studies have shown that a critical factor in productivity and workplace satisfaction is the ability to choose when and what music they listen to (Krause et al., 2015; Korczynski, 2014). Not surprising, researchers found that the lack of control over music choices generated negative emotions and decreased job satisfaction. (Liljestom et al., 2013). So, if you’re paying for a company or department-wide music service, you may want to poll your employees to see what they think. After reviewing a dozen or so studies on this topic, I couldn’t find a definitive answer in whether music impacted the workplace positively or negatively. What is clear is that having the ability to choose what and when they listen to music, is critical for employees. So, in the absence of definitive proof either way, it seems that the supervisor that I recently talked to had it right: allowing employees to choose to listen to music or not seems to be the best course of action, unless the situation is one where employees need to interact with each other or with customers. Then, hopefully common sense would prevail and listening to music would not be allowed. While it may be unclear whether music at work can boost productivity, there is a large body of evidence that supports the thesis that music can induce positive emotions and moderate negative emotions (Bell et al., 2016) and can aid in developing the relaxation response (Groarke et al., 2016). This is why we offer a number of exercises to help you develop your mindful music practice. Developing the ability to focus your attention on music – and not mindless listening – can help you not only learn to regulate your emotions, but can also help you improve your ability to focus your attention (Bell et al., 2016). So, the next time you feel a little stressed, or feel like you need a boost, “Take 5” and mindfully listen to your favorite piece of music. Bell, T. P., McIntyre, K. A., & Hadley, R. (2016). Listening to classical music results in a positive correlation between spatial reasoning and mindfulness. Psychomusicology: Music, Mind, and Brain, 26(3), 226. Dobbs, S., Furnham, A., & McClelland, A. (2011). The eﬀect of background music and noise on the cognitive test performance of introverts and extraverts. Applied Cognitive Psychology, 25(2), 307–313. http://dx.doi.org/10.1002/acp.1692. Groarke, J. M., & Hogan, M. J. (2016). Enhancing wellbeing: An emerging model of the adaptive functions of music listening. Psychology of Music, 44(4), 769-791. Haake, A. B. (2011). Individual music listening in workplace settings: An exploratory survey of oﬃces in the UK. Musicae Scientiae, 15(1), 107–129. http://dx.doi.org/ 10.1177/102986411398065. Korczynski, M. (2014). Songs of the factory: Pop music, culture, and resistance. Ithaca, NY: Cornell University Press. Kou, S., McClelland, A., & Furnham, A. (2018). The eﬀect of background music and noise on the cognitive test performance of Chinese introverts and extraverts. Psychology of Music, 46(1), 125–135. Krause, A. E., North, A. C., & Hewitt, L. Y. (2015). Music-listening in everyday life: Devices and choice. Psychology of Music, 43(2), 155–170. Landay, K., & Harms, P. D. (in press). Whistle while you work? A review of the effects of music in the workplace. Human Resource Management Review. Liljeström, S., Juslin, P. N., & Västfjäll, D. (2013). Experimental evidence of the roles of music choice, social context, and listener personality in emotional reactions to music. Psychology of Music, 41(5), 579–599.